Powers/Abilities: Constantly moving at superhuman speed ("Whizzspeed"). 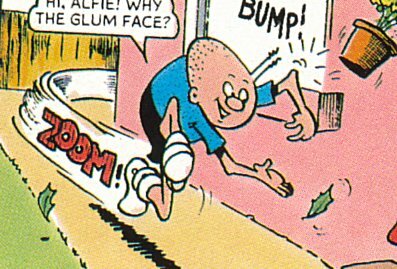 Billy tends to forget how destructive his supersonic passage can be, and has a very short attention span - much like the considerably later DC character Impulse. History: Billy Whizz is a young lad who does everything at superhuman speeds. Though his brother appears to be normal, Billy's father, grandfather and various ancestors have also demonstrated superhuman speed, so it appears to be a familial trait, albeit one that skips the odd generation. Comments: According to Val, who wrote into me, Billy is based on her husband, whose uncle, Malcolm Judge, created the character. 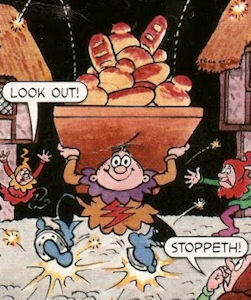 Billy's ancestor, William Whizz, delivered bread for a baker in 1666 London. Because William was wearing out a pair of shoes every time he raced around town, the baker had a blacksmith attach horseshoes to William's footwear to make it more durable. Unfortunately, this also caused him to kick up a stream of sparks as he ran, causing what became the Great Fire of London. 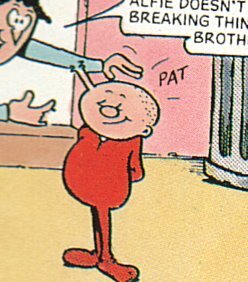 Billy has a little brother called Alfie, who occasionally features in his own spin-off strip. Unlike his sibling, he appears to have no powers. 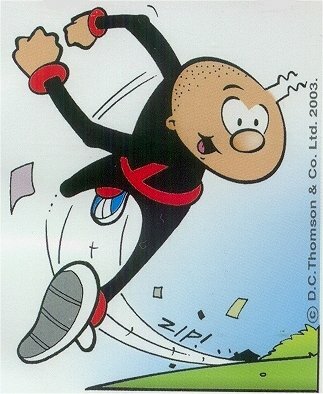 While the original strip he comes from is done for laughs, the character turned up (as Jimmy Quick) in a more serious role in Grant Morrison's Zenith storyline, fighting the dark gods along with a number of other British heroes.